Some of you have asked if we speak any spanish and the answer is “sorta”. One of our goals during our South American sabbatical was to become fluent in spanish. When we were in Guatemala this past February, I was a champ…soaking in words like I couldn’t get enough! 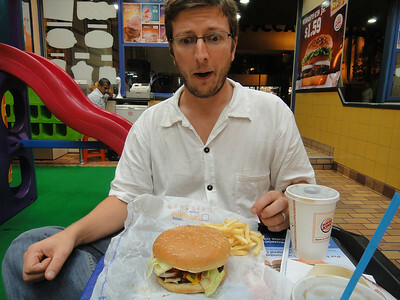 Upon arriving in Colombia, I was not as savvy. They spoke so fast there. It seemed as though I had begun learning a completely different language. After 2 weeks in the country, I was feeling pretty defeated and wanted nothing more to do with it. I was ready to throw in the towel which was depressing me even more. We then met Beth and Jason, backpackers who had been traveling for 9 months. They too had the goal of learning spanish while on their SA tour. To my surprise, they were only able to “just get by”. I was a little shocked. I wasn’t expecting to absorb the language via osmosis, however I did expect that living in spanish speaking countries would force us along. I could see that we were going to have to take a more aggressive approach, if for no other reason than to correctly “biggie size” our drinks instead of our burgers. Taking lessons similar to the ones we took in Guatemala hasn’t panned out. I was hoping I could pick up some classes in Salinas since we’ll be here for the entire month of November, but alas, no classes are offered. So, I am now forced to progress on my own. Dusty and I have both read a book on language learning which has helped to organize our efforts and set some goals. I want to achieve the following goals by February 15, just 3 months away. Anyone that has learned a second language, please let me know what you think of them. Watch a 30 minute television show and understand 75% of it. Read a magazine article and understand 75% of it. Converse with a local for 15 minutes. Follow a recipe written in Spanish. See a movie in Spanish and not have to have English subtitles to understand 75% of it. Know the names of every vegetable at one market stand. Learn the names of 20 construction materials. Write and entire blog post in Spanish. So, I have 9 but I’d like to make it an even 10. Please offer any suggestions in the comments section! I think that when learning anything, you have to stay interested in the subject. So, to do that, I’m going to stick to subjects that interest me such as food, houses and travel. I’ll also have several different manners of studying. I’ll require that I do 1 of these per day but if I’m feeling really motivated, I can do as many as I like. I’ll do at least one of these for 20 minutes a day. I once implemented a workout strategy that only required me to exercise for 20 minutes every day. It’s not much, but when I thought about only having to do it for 20 minutes, it didn’t seem so overwhelming and I was more likely to do it. I also found that after I had started the workout, I was on a roll and wanted to do more than 20 minutes. That strategy worked for me before so, I’m going to try it again with language learning. Heck, I might just do both at the same time! Bilingual and skinny sounds even better! As extra pressure to stick to these goals, I’ll blog about my progress. Wish me luck!